I’m curious about “well” played guitars and their worn finishes? I’ve been playing for 40 years and have never had a guitar develop any sort of wear patterns in the finish. Is this just a phenomenon of older/ different finishes? I’ve had my nitro finish Annie since 2008 and play the hell out of it. It has some nicks and slight scratches but no wear patterns. What’s the deal with necks where the finish starts to wear off? I do like the look of a well played guitar. Is relicing the only way a modern guitar will ever look like this? I understand how poly finishes will never look this way on their own, but I thought nitro would? I have 70 year old guitars that look whupped and nearly new. Seems like the solid bodies deteriorate quicker, but this is a purely anecdotal and unscientific opinion - perhaps it's a function of relative cost to owner care issue. How often its played will naturally make a difference. Like shoes if you wear only one pair they’ll look worn out in a short time. But if you have several pair and rotate them ten year old shoes can look like they are one year in age. Thee are a lot of factors that affect finishes. The finish on Rory Gallagher's Strats worn off for something in his sweat. My 62 Falcon was previously owned by an LA studio musician and it looks like he used the money frets. Hmmm.... perhaps some folks have some acidic sweat? Yeah and you'll see less and less because the poly family of finishes are completely seal off the wood so nothing gets in or out so they won't wear. My ‘77 Super Chet has wear on the neck and a few marks here and there but is in overall very good condition. I view it as a sign of an instrument that was loved and played a lot versus a case queen which may also be great or possibly not and therefore stayed put. I don’t think it was neglected or abused. I will ogle a case queen as much as anybody would, but feel like that the honestly worn guitar is the better one because of its use and wear. Yes. It's a combination of genetics, diet, and other habits/factors. Heavy smokers have more acidic sweat than non-smokers with similar genetics and diet, etc. It’s funny, some instruments develop wear quicker than others. In the early 80s I had a LP Custom and I wore off some of the lacquer on the back of the neck within a few years. And I also wore through the top in the place where my pinky used to rest. I have been playing Gretsches since '87 but never created wear like that. My hands are dry and my strings stay good forever. So it wasn’t acid or anything. But several of my old Gretsches have lots of wear but that was there before I got them. Specially my '61 6121 and my '59 Annie (And my '60 tele) . They have no lacquer on the back of the neck and I really like that feel. There's some honest wear on the neck of my BST that was my main player for years. Some embarrassing belt rash on the back too. My G5191BK has a shine below the strings where it used to be matte finish. The rest of my guitars don't show many signs of play and they don't get near as much attention so that makes sense. I used to be all eaten up with the worn Fender maple neck look ... but sorta went off that scene. First time I recall seeing it was that 1970 Clapaton album where Brownie is up front and center, and that gutiar was maybe 12-13 years old at the time. Still guitars all wear in all different ways and places .. .interesting to see the differences. I noticed that black 63 Country Club, my CG 63 CC and another almost identical CC have [not at all] similar neck wear. It makes me think they were played by the same guy. I haven’t noticed any wear since I bought it almost 25 years ago. It has to be the player. This is actually way more neck wear. Seeing that non-factory backpad Joe, I'm wondering if you know the story behind who put it on there? I don't figure it's you as you've only had it awhile and didn't mention doing this. I'm thinking a previous owner did it to prevent belt rash as it isn't covering an access hole for a mute system. 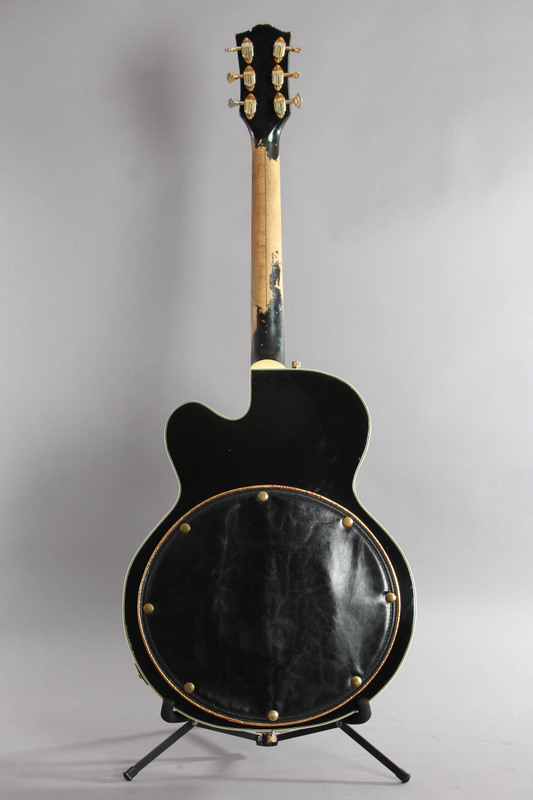 BTW, when I got my '72 with the very thick neck, it was worn along the flat bottom area but not up the sides. Dave - I’m guessing that the back pad was a factory addition as I believe the guitar was a special order given its other features. I'm lucky because my hands don't get particularly sweaty so my strings last a decent while unless I play gigs. A friend of mine was very different though - he would barely touch my guitar and the strings would turn black and fall off. I couldn't bear to play his guitars - the strings felt disgusting. I doubt it was his hygiene because he was a theatre surgeon! I have read that Fender used very thin finishes in the 60s as demand increased for their guitars and that is why they wore so quickly. My guitars only seem to show wear on the frets. And they stay quite clean except for where my right arm rests on the upper bout and around the bridge pickup where my nails wear down and leave dust on the guitar. Easy enough to wipe down when restringing. That sure is an oddball Joe! What do the 2 switches and 2 controls do, and what are the black things? Are they plugs for previous controls or are they functional? The switches and controls work like a normal Gretsch. Note - does not have controls on the pick guard and never had a switch on the upper bout. The custom part of this guitar is that it was apparently set up originally as a stereo. That is the 70’s configuration for a Gretsch stereo. I have a strong attraction to matte finishes. 4 Takamines and now a Taylor all came with matte or satin finishes. However, within months, those finishes start to shine and glow in areas like below the strings (no pickguards on these examples) and under my sleeve.. Eventually, that glow begins to spread and after about five years covers most of the surface of the instrument! This usually makes me sad and results in yet another explanation to my dear Lady about why is there yet another satin-finish guitar in that stand over by the.....? One odd addendum- I do have fairly high-acid sweat. I tend to damage leather-wrapped steering wheels and shift knobs after only a few months, yet my guitar strings can last for upwards of a year unless they happen to be on a gigging guitar. Not sure what this means, however. My guitars only have neck wear at the very top end, from hanging on the wall hanger.